Aging as a Spiritual Practice | A Practical Peacemaker Ponders . . . 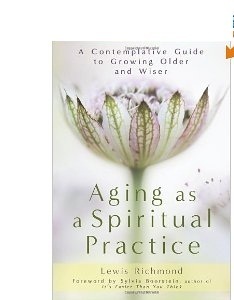 Aging As A Spiritual Practice: A Contemplative Guide to Growing Older and Wiser, by Lewis Richmond. Gotham, 2012. This has much that will be helpful to the over-60 as well as to younger people who are caring for aging family members. The text is interspersed with the author’s reminiscences of studying in his youth with famed Buddhist teacher Shunryu Suzuki, and “Contemplative Reflections” that assist in looking at life in helpful ways quite different from mainstream viewpoints. Not just for Buddhists or meditators, though, the book provides comfort for anyone dealing with aging-related issues. The author, in his mid-60’s, has experienced severe illnesses himself, including two weeks in a coma, so writes with understanding of facing physical and mental difficulties, yet remaining positive. A similar book to read alongside is This Is Getting Old: Zen Thoughts on Aging with Humor and Dignity, by Susan Moon (2010).